The North Shore Aero Club was formed in the early 1960s as an offshoot of the Auckland Aero Club. Land was bought for an aerodrome at Dairy Flat in 1963, the purchase being financed by debentures raised among club members and flying started in 1964. 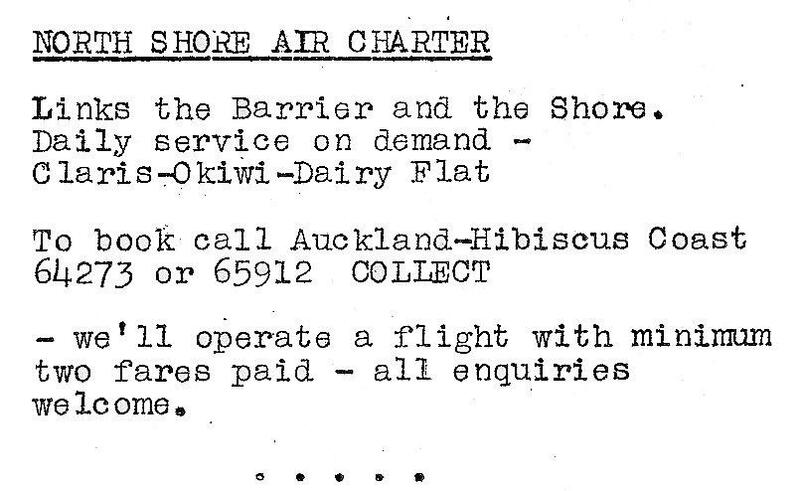 By the late 1970s the Aero Club operated a regular, on-demand air taxi service from Dairy Flat to Great Barrier Island under the club’s aerial work licence under the North Shore Air Charter banner and using 2 Cessna 172s, 2 Cessna 177 Cardinals, a Cessna 206 and a Piper Cherokee Six. Later aircraft included a Piper Cherokee 180, Cessna 182 and Partenavia. 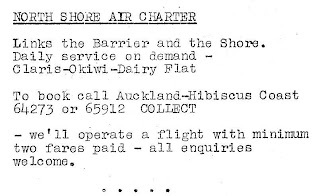 In these days the competition was the Auckland Aero Club and more expensive Mount Cook Airlines/Sea Bee Air amphibious service so a service from the North Shore was a viable alternative. On busy days the Club operated as many as 7 daily return trips to both Claris and Okiwi airfields. Cessna 172 ZK-DXI at North Shore on 24 May 1988. Cessna 206 ZK-EJG at the Palmerston North air show on 19 January 1986. Two shots of Piper Cherokee Six ZK-EKS at North Shore - above on 1 November 1986 and below on 24 May 1988. In late 1983 new competition appeared on the Great Barrier run in the form of Great Barrier Airlines. 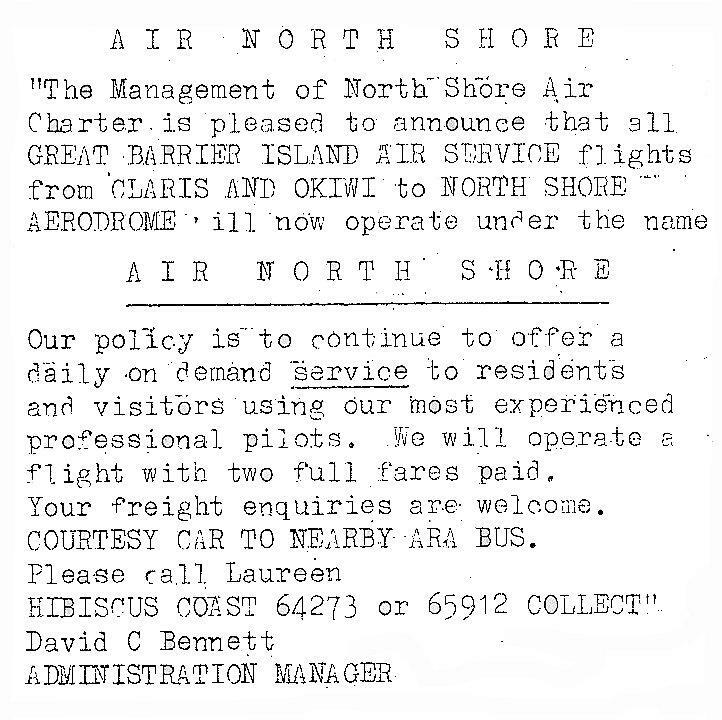 While the competition, which operated from Ardmore and Auckland, did not effect Air North Shore, it did have a serious impact on the Auckland Aero Club’s NZ Air Charter service which ceased on the 1st of July 1984. 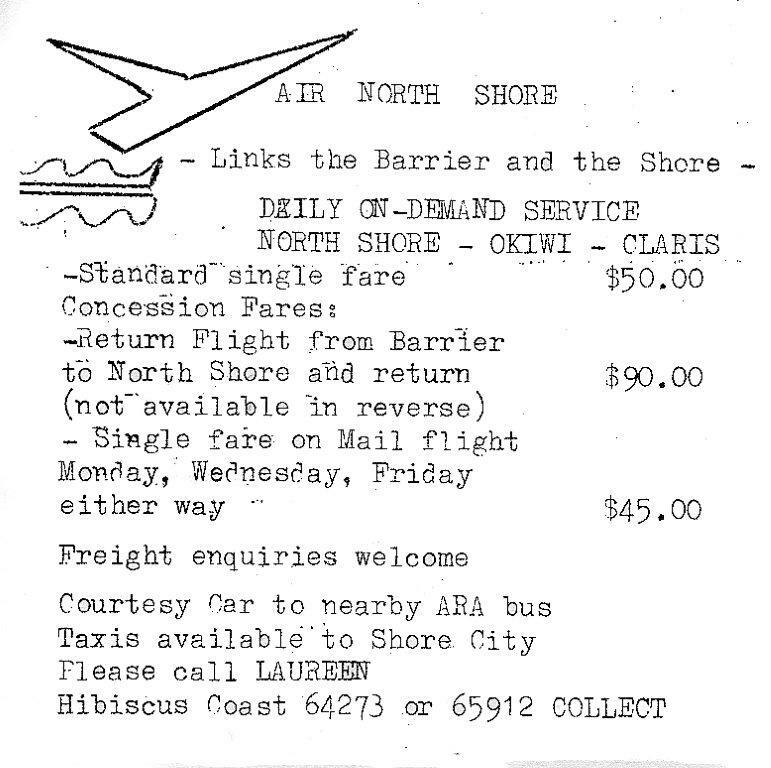 The following month, in August 1984, the North Shore Aero Club rebranded its air transport division as Air North Shore and by December that year had picked up the NZ Post Office mail contract to the island and for some years operated a mail flight to the island from North Shore Airport on Mondays, Wednesdays and Fridays in addition to its other flights. Two of the later aircraft. Above, Cessna 182 ZK-FGY at North Shore on 1 November 1986 and below Partenavia ZK-ERA on 24 May 1988. 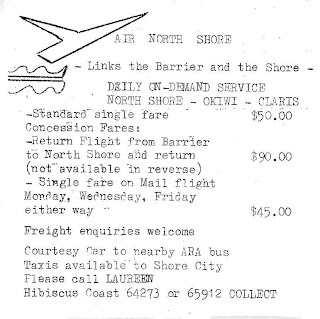 Eventually the mail contract was loss and the introduction of fast ferries on the Auckland to Great Barrier route also eroded Air North Shore’s business and the Great Barrier service became a much smaller part of the Aero Club operation. 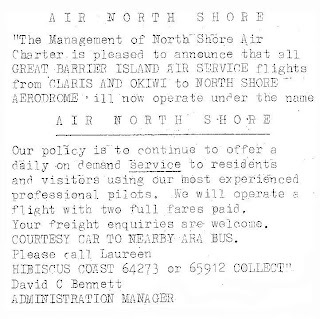 In 1993 the North Shore Aero Club restructured their activities and sold the Great Barrier air service and commercial air charter work to John Dale who operated as New Zealand Air Services Ltd.
Io m an 83year old mad aircraft model builder from way back and still flying control l ine. Plus r./c. Still very interested in all aircraft interests. Regards Stan Rusbatch.